The new crane system of the hydroelectric power plant builders VVE in the Slovakian town of Dubnica nad Vahom, 140km northeast of Bratislava, called for some expert engineering. 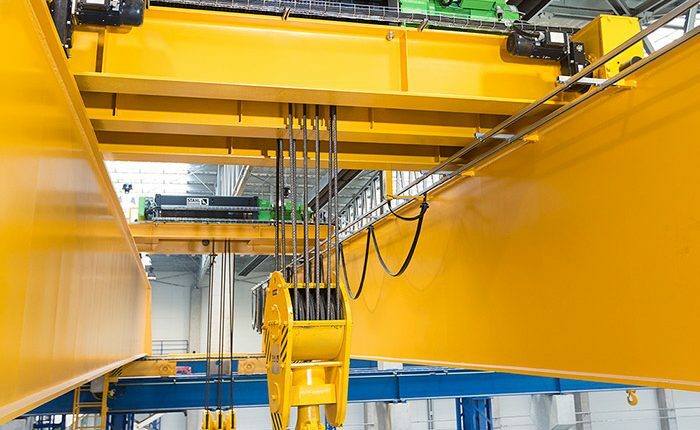 What first appeared to be a standard order for four heavy-duty double girder overhead travelling cranes soon turned out to be a tricky problem when the structural engineers specified foundations that threatened to blow the budget of the construction project. Stahl CraneSystems’ Slovakian crane building partner Jaroslav Beneš – Žeriavy accepted the challenge. He succeeded in modifying the crane system so that VVE could dispense with additional cost-intensive measures. VVE commissioned its new building in autumn 2015. Beneš’s team had managed to reduce the load applied to the building by the crane system to a minimum. The Eastern European crane building expert implemented an intelligent crane control that analyses the load and position data of all the cranes, crabs and hoists in real time and controls the lifting and travel motions of the whole system on the basis of this data. The Slovakian crane builder Jaroslav Beneš – Žeriavy has been working successfully with crane technology from Stahl CraneSystems for many years and is now one of its most important partners in the emerging Slovakian market. With a rise in gross domestic product greater than 3%, Slovakia is one of the most dynamic economies in the euro zone, with possibly even higher growth in the coming years. Strong domestic demand from private households and the public sector are stimulating the economy, with the automotive industry remaining another important driving force. VVE has taken a major step towards practically self-sufficient production by commissioning its own production line for hydroelectric power plants. In the future, components for locks and hydroelectric power stations will be produced in the modern factory to advance the energy turnaround in Slovakia too. Four cranes work in the new industrial building, with safe working loads of 180 and 90t in one bay and of 175 and 85t in the other. The solution of crane builder Jaroslav Beneš – Žeriavy is based on load measurement, accurate laser-based position monitoring of the crane bridges and crabs and of the distances of the cranes between one another and continuous intercommunication between the cranes. Every crane is equipped with redundant PLC controls that analyse the data of all the cranes in real time, even if a crane is currently not in operation or even shut down. When the specified limits are approached, the controls reduce the lifting or travelling speeds of individual cranes, crabs or hoists or they reduce the speeds of the complete crane system. If a single crane or a number of cranes combined reach the maximum permissible load of the building, the system halts all movements, which might increase the load further. As the lifting capacity of each of the two largest cranes could exceed the load capacity of the crane runways, the maximum permissible load for these two depends on the position of the crabs. The lifting capacity of the largest crane decreases linearly from 180t in the centre of the crane bridge towards the outside. The movements and the relations of the crane bridges to one another are also analysed: if the 180t crane is working with full load, the 175t crane in the second bay can only travel past it if it is unloaded and its hoists are at the opposite end of the crane bridge. The effects exerted on the building by the load are determined individually for each crane with due consideration to the data of the other cranes. The cranes communicate continuously and redundantly on separate WiFi channels. Tandem operation is possible if large machinery components need to be lifted. The two hoists or crabs on the individual cranes, or also the two cranes in each bay, can be combined to operate in tandem if required. The high lifting capacities are achieved by combining Stahl CraneSystems hoists. The larger cranes are each equipped with a twin hoist, type ASF 7 ZW with 125t SWL )safe working load), supplemented by an auxiliary hoist, also an ASF 7, with 55 or 50t SWL. The smaller cranes are each equipped with a 50t ASF 7 wire rope hoist and an ASF 7 auxiliary hoist with 40 or 35t SWL. Frequency converters ensure soft and smooth lifting and travelling movements, thereby reducing the load on the building structure. Following completion of this project and in view of the positive economic forecasts, the signs for the future in Slovakia bode well for further successful crane projects with crane technology from Künzelsau.